A young artist in the northern Indian state of Bihar has been busy collecting politicians' old linen to make his own statement ahead of the general election. 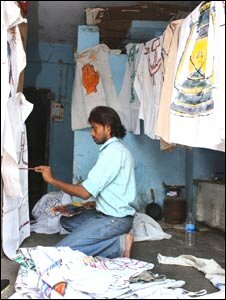 Kunal Mitra has been collecting discarded all-white kurtas (long tunics) and pyjamas worn by Indian politicians and painting them with party symbols as well as other poll-related pictures. His message? That politicians who wear the same coloured clothing are also of the same colour in character - "corrupt, thick skinned and insensitive to art". "After winning elections, they show their real skin and colour - to make money and cheat common people over the promises they made," Mr Mitra says. The paintings go on show at an exhibition in the state capital, Patna, from Friday. Mr Mitra, who studied fine arts at Patna's prestigious College of Arts and Crafts, thinks elections are the best time to exhibit his paintings. The young, struggling painter says he wanted to collect about 500 discarded tunics from Bihar politicians, but had managed to collect only around 200. For the past six weeks, he says, he has been making the rounds of flats, houses and bungalows of politicians to gather their clothing. He wrote a brief computer-printed application asking the politicians to part with their old linen for his painting exhibition. "I knocked on their doors and give them my application to read. Some mistook me for a beggar, some for a criminal or a thief, some thought I was unemployed and looking for a job. Some offered me a job as a domestic helper." He adds: "Most refused to part with their old clothes and some of the reasons they gave were quite interesting." A minister in the state government told him that he had only two pairs of clothes and he was unable to part with them. "I knew he was lying but could do nothing except go from his door with a smile." Another prominent leader kept him hanging around on and off for 10 days before denying his request. But Mr Mitra said he did not lose heart and kept knocking on doors. Once, he says, he called on a legislator infamous for his criminal background. "When I asked him for his discarded clothes, he said he couldn't give me any as he used them for committing crimes." Another legislator was willing to give Mr Mitra a pair of his old clothes but "his wife snatched it away from him saying she would use it for cleaning her car". Mr Mitra says not all the politicians were unfriendly. "One state minister who wears only a loincloth borrowed a set of clothes for me from somewhere else after I sent him my request." 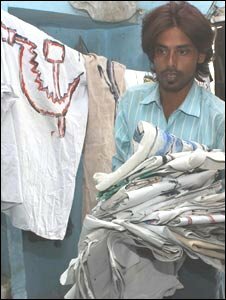 The "best of the lot" were the Communists - all provided Mr Mitra with a set of old tunics and pyjamas. "That gesture of the leftist leaders touched me the most. They are unlike other politicians. They are sensitive and understanding," says the artist. Mr Mitra acknowledges that he may be inviting the wrath of politicians with his art. "I know what I'm doing is risky but being a painter I have to paint what I believe in", he says. Human Resources Minister Hari Narayan Singh, who provided Mr Mitra with clothing, told the BBC the idea was "noble... though it will be quite hurtful for the politicians. Above all it's an artist's impression and we should appreciate his vision." Mr Mitra lives in a dingy room in a dilapidated house in Patna's Kidwaipuri district. He cooks for himself, spends his mornings and evenings collecting clothes and paints in the day time. 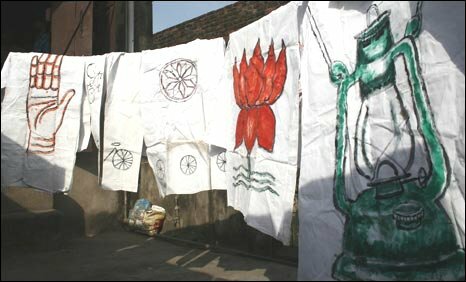 "I usually try to paint the politicians' party symbols on the clothes they give me," Mr Mitra says. He also paints poll-related graffiti to reveal the ways employed by politicians to get votes during elections. Mr Mitra plans to bring his show to the capital, Delhi, after the elections.